Every cloud has a silver lining, so they say, and for Judy Clay it was a very small cloud. She was so highly respected by all who knew and worked with her and people in the music industry couldn’t have spoken any higher about her voice, so it very sad that she wasn’t more successful than she was. Clay, who was born Judith Guions, was a talented soul singer whose career began in 1959 when she joined the Drinkard Singers gospel group with a line up that included Whitney’s mother Cissy Houston. Within a couple of years she moved from gospel to soul and released a number of singles on various labels including Scepter, Ember and Atlantic, but nothing interested the record buyers. She was a massive in-demand backing singer and gave her services to Booker T. & the MG’s, Mongo Santamaria, Donny Hathaway, Patti LaBelle, Wilson Pickett, Aretha Franklin, Van Morrison and Ray Charles, she also teamed up with Billy Vera, a white soul singer from California to record the song Storybook Children which was a modest US hit in 1967. 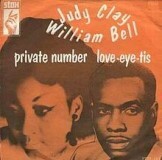 When Judy died in 2001, Billy wrote an obituary which appeared in The Guardian; he said, “Judy Clay was a hell of a singer, but, apart from two duets with me, Storybook Children and Country Girl-City Man in 1968, and two records later that year with William Bell, Private Number and My Baby Specialises, she had no chart success. This must have been no small source of frustration. You can’t have a voice as good as hers and not know how good you are; she was, arguably, one of the best in her adopted family. As an act, Judy and I were notable for being the United States’ first racially integrated duo, a fact which, even in the 1960s, prevented us from being seen on national television. Other than an appearance on Hy Lit’s show on WKBS in Philadelphia, and one on Robin Seymour’s Swingin’ Time in Detroit, our little revolution was never televised.” Storybook Children had an extra hindrance getting television airplay and that was because she’d married a jazz drummer called Leo Gatewood Sr. in 1966 and was pregnant with their son Leo when she made the recording and people in the industry thought it was Billy’s child and they weren’t married. Why didn’t anyone think to ask? Bell explained how he was quite happy being in front of the mic as well as behind it and how he got a record with Judy, “I was one of those artists that always wanted to know the inner workings, behind the scenes – engineering, production, how to mike drums etc, so if I were home and not touring, I’m in a studio. I was in the studio a lot of times, and Judy happened to be cutting a session, and she didn’t have enough material. I had a verse and a chorus on Private Number, so I said ‘well, I’ve got one song, but I’ve got to finish it’. Jim (Stewart, producer and co-founder of the Stax label) said ‘she’s only gonna be here through tomorrow. If you can finish it overnight, then we will record it the next day’. Booker T (who would become the co-writer) and I went to his home and stayed up all night working on this song. We came in the next day, and of course Judy didn’t know it enough to record it, so I sang the whole song down. They took the tapes back to New York. After she learned the song, she said ‘well, I’ll do it’, and after she started singing somebody got the bright idea ‘this could be a great duet’. So that’s how it came about, and Private Number was written only with Judy Clay in mind.” Some sources have cited that it was originally written with Otis Redding in mind, this confusion probably arose because Bell had recorded the song A Tribute to A King which was written about Redding who had died six months earlier. Private Number reached number eight in the UK chart but brought to a new audience 21 years later when the boy band 911 recorded a version and took it even higher by peaking at number three. In 1970 Judy had her only solo hit in America, I say hit, it stalled at number 122 and was called Greatest Love. She was obviously more successful with a duet partner and later that year Atlantic signed her and re-paired her with Vera again to record Reaching for the Moon. It was well received among the black community but did nothing chart wise. By 1978 her marriage had fallen apart and she’d had so many disappointments with her singing career that she’d had enough. The following year she underwent surgery for a brain tumour and returned to her hometown of Fayetteville, North Carolina to convalesce. She returned to the church, promising God that she would no longer sing secular music and on completion of a tour of South Africa with Ray Charles in 1981 she’d kept her promise, apart from occasionally sanging in Cissy Houston’s Baptist choir.